Violeta Friedman was a Jewish Holocaust survivor who, through her fight for tolerance and remembrance, led Spain to reform its legal code and earned a permanent place in history. Ms. Friedman was born in Romania in 1930. Before her 14th birthday, she and the rest of her family were deported by the Nazis to the Auschwitz concentration camp, where her great-grandparents, grandparents, and parents were executed in gas chambers on the night of their arrival. She and her older sister, the only survivors from the family, remained at Auschwitz-Birkenau until the camp was liberated in 1945. Following the war, Ms. Friedman moved to Canada and later to Venezuela, where she married. In 1965, she and her children moved to Spain. For almost forty years after leaving Auschwitz, Violeta Friedman remained silent about her traumatic experiences. However, in 1985, she initiated a landmark legal process against Holocaust denial, becoming a voice for Holocaust survivors and upholding her duty to retell the past. The case was against Leon Degrelle, a former general of the Nazi´s Waffen SS, who sought asylum in Spain after Belgian courts sentenced him to death following the war. In 1985, Degrelle released racist and anti-Semitic statements in the Spanish magazine Tiempo (Time), in which he denied the Holocaust and the existence of the very gas chambers where Ms. Friedman´s family perished. In response to these statements, Violeta Friedman launched what would be a pivotal six year judicial process against Degrelle. Friedman’s lawyer, Jorge Trías Sagnier, affirmed that Degrelle had attacked Friedman’s honor by denying the Holocaust. He appealed the sentence of a previous hearing in Madrid, in which the judge had acquitted Degrelle on the grounds that he had not mentioned Ms. Friedman specifically. Degrelle´s lawyer, Juan Servando Balaguer, defened Degrelle by appealing to freedom of speech. During the trial, Friedman affirmed her strong support of freedom of speech, but maintained that it must not injure other citizens, and she explained that: “[Degrelle’s] declarations have traumatized me because they intend to deny me the most basic rights that I have left, and I will do what I must to ensure Justice.” According to Friedman, this was a fight against the racist ideology that seeks to incite hatred and violence. Throughout the judicial process, she was frequently confronted by neo-Nazi groups and supporters of Degrelle shouting anti-Semitic exclamations such as “Hitler was right.” After six years of trials, the case finally came to a close. On November 11, 1991, the Constitutional Court decided in her favor that Degrelle was guilty of attacking the honor of Violeta Friedman and all victims of Nazi concentration camps. According to the Spanish constitution, freedom of expression may not legally be used to spread racist or xenophobic ideology. This crucial sentence became the precedent for Spain’s reform of its Penal Code in relation to racism. Violeta Friedman was a devoted advocate for liberty, tolerance and human rights; a champion against historical revisionism and the trivialization of the holocaust. Since her famous court action, Ms. Friedman dedicated herself to preserving the memory of the Holocaust to prevent it from ever happening again. In 1995, she published a book entitled Mis Memorias (My Memories). That same year, the Federación de Mujeres Progresistas (Progressive Women’s Federation) honored Violeta Friedman, alongside six other women, with the title of “Progressive Woman” for her “significant actions against intolerance.” In Spain, Ms. Friedman participated actively in the fight against terrorism and the support of victims of racist violence. She also undertook a comprehensive educational campaign to promote tolerance in future generations. In 1996, she was named a “President of Honor” by the Movement against Intolerance. Violeta Friedman passed away in Madrid on October 4, 2000. The Universal Academy of Culture verified the dangerous international advance of intolerance (be it racial, religious, gender-based or cultural) and its penetrating role of stimulating hatred in an International Forum, where it thoroughly analyzed the problem and its dramatic expression in Europe, framing it historically as an idea of “institutionalized intolerance that explains the concentration camps, the crematoria, the physical torture, the ossuaries, the deportations, the Gulags and the confinement.” In reality, history provides us with an endless number of examples. “Individual and collective intolerance came together to bring about the Inquisition, religious wars, genocides, totalitarian purges, fascism, fundamentalism, etc,” affirmed the Academy. Elie Wiesel, survivor of Auschwitz and Nobel Peace Prize winner, affirms in his introductory text for the Forum that intolerance “is not only the vile instrument of the enemy, but the enemy itself.” He insists that it is the prelude of hatred and violence and that both intolerance and fascism inevitably lead to the humiliation of one´s fellow man and with that, the denial of his humanity and his possibilities for development. Demonstrations of intolerance consecrate as a common value, not the people with diverse identities, but rather the very identity that opposes those who it does not accept and to whom it denies respect and appreciation. It is the common denominator and it appears in connection with demonstrations of racial, national, sexual, and religious hatred and other behaviors that discriminate, segregate, attack and incite against groups, minorities or people who happen to be, think, or behave in a different manner. When Intolerance transforms into a collective or institutionalized act, it undermines coexistence and democratic principles, and it presents a threat to world peace. But, how should one combat intolerance? We know how to confront fascism because it is a system, a structure, a will-power that we must unmask, reject, condemn, and exclude from democratic societies. However, as the Academy asserted, with intolerance it is more complicated because it is subtle, because it is a common disposition that potentially nests within each of us, and because it is difficult to identify and to detect its characteristics. It feeds prejudice, and as Einstein said, “it is more difficult to neutralize an atom than to divide it.” But the most serious problem, as indicated by the Academy, is the malleability of intolerance, because it does not form part of a system, nor of a religion, nor of an ideology, but rather of the human condition itself, present in each of us, penetrating with a greater depth than any ideology, existing at the very origin of phenomena of a distinct nature. The current economic crisis is making possible the dissemination of prejudices and stereotypes that feed xenophobia, spreading intolerant discourse, which is very dangerous in electoral campaigns, and which damages democratic coexistence, social cohesion, and intercultural integration. Many of these vile acts are spread openly on the Internet, fueling hatred, and racist concerts, demonstrations with openly xenophobic expressions and cries, propaganda campaigns that violate the dignity and the rights of immigrants, minorities, and all of society also occur, and we do not find ourselves surprised by attacks against offices of leftist political parties, cultural associations, and social organizations. To this long list, one must also add the assaults against people, which in some cases have irreparably led to murder. 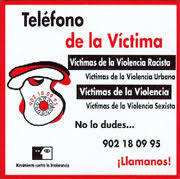 The ley de Igualdad de Trato (the Equal Treatment Act), pledged by the government of Spain, is an opportunity to fully respond to discrimination and hatred, provided that it establishes measures to support victims and creates the Fiscalías de Delitos de Odio y Discriminación para todas las Comunidades Autónomas (Prosecutor´s office of Hate Crimes and Discrimination for all Autonomous Communities) and a reform of the Penal Code that would punish incitement and not leave any room for impunity, placing us within the international mandates for fighting effectively against racism, xenophobia, and intolerance. Together, we can do it. (Article published in the Diario Público. 11/16/2010). The Court of Barcelona imposed penalties of up to three-and-a-half years’ imprisonment to four people accused of inciting the genocide of the Jewish people. Next March 10th, the Supreme Court will review the 2009 ruling by the Provincial Court of Barcelona that sentenced up to three-and-a-half year´s of imprisonment to the four people responsible for their now vacated bookstore, Kalki, in Barcelona, and for a publishing company in Molins de Rei (Barcelona) for selling material with Nazi ideology. The Court will consist of judges Adolfo Prego, Andrés Martínez Arrieta, Alberto Jorge Barreiro, Diego Ramos and Miguel Colmenero, who will be speaker of the resolution, according to sources from the High Court. The ruling handed down in October 2009 by the Court of Barcelona considered it proven that, between January and July of 2003, through their bookstore (located on Argenter Street in the Sant Pere district) and through their website, the defendants sold all sorts of publications that justified and exalted the Nazi regimen and incited the genocide of the Jewish people. According to the court, some of the books and magazines that were confiscated from the bookstore and the private homes of the defendants also incited the discrimination, exclusion, and elimination of various racial and social groups, while exalting and justifying totalitarian fascist regimes based on the supremacy of the Aryan race. Additionally, several documents ridicule or trivialize the Holocaust, which, for the judges, was equivalent to justifying it. The sale of this type of book constitutes the continued crime of the dissemination of genocidal ideas and also of the violation of fundamental human rights and public liberties, as the Court of Barcelona reminded. In particular, the court convicted Ramon B.F., president of the neo-Nazi “Círculo de Estudios Indoeuropeos (CEI)” (Indoeuropean Study Circle), to three-and-a-half years of prison and a 6,000 euro fine for the diffusion of genocidal ideas, the violation of human rights, and illegal association. Likewise, the Court sentenced Oscar P.G., bookstore owner and leader of the CEI, with three-and-a-half-years imprisonment and a 3,600 euro fine for the same three crimes. Carlos G.S., leader of the CEI, was convicted of the three same offenses and sentenced to three years in prison and a 3,240 euro fine, while the fourth defendant, Antonio L.S., owner of the publishing company, was punished with two-and-a-half years of prison and 2,400 euros in fines for the diffusion of genocidal ideas and the violation of human rights. The CEI, founded in Valencia in 1997 by Roman B.F., promoted this ideology. It had as its slogan: “Hermandad y Aria” (Aryan Brotherhood), and as its symbol, the initials of this slogan, H and A, which coincide with the initials of Adolf Hitler. Moreover, it required all of its members to dress in uniform, with brown shirts and pants and military boots, in addition to a bracelet with the symbol of the entity. The leaders of the group aspired to be a type of “Estado Mayor” (General Staff), calling themselves “SS,” that could impose a fascist system anywhere in Europe even if though military means. The oath to belong to the paramilitary group promised eternal fidelity to Hitler and to his ideas. Investigations began at the end of 2002 with the knowledge that the defendants were distributing this type of material through their bookstore and publishing company. The aforementioned bookstore sold books edited by the publishing company, and due to this, los Mossos (the Catalan Autonomous Police) discovered professional and commercial ties between the detained parties. In the searches carried out in July 2003 and May 2004, the agents seized 10,000 books, videotapes, magazines, publications in other languages, “fanzines” and swatstikas. The majority of the publications were distributed within Europe, especially in France and Portugal, as well as in South America, primarily in Chile. The sentence ordered the confiscation of all of the materials. Due to police pressure, in May 2005, the CEI dissolved and in November 2006, it gave 18,000 euros in accordance to the ruling in favor of the Comunidades Israelitas de Barcelona (Jewish Community of Barcelona), SOS Racismo, and Amical Mathausen, which appeared in court as popular accusers. A similar case occurred with the Librería Europa (European Bookstore) in the Gràcia de Barcelona district, whose owner, Pedro Varela, was also convicted of justifying the Holocaust. What to say about these three names that has not already been said. The truth is that written in this order, they tell a historical, but above all, human narrative of the essential experience of the Jewish people since the times of the Middle Ages until the present. This sequence contains the experiential DNA that inevitably affects the identity, or if you will, the collective soul of an entire people. The backdrop, omnipresent in this trajectory, has been and is anti-Semitism, an expression of hate that is rooted in the dawn of history. The first mass extermination of Jews dates back to the days of Pharaoh Thutmose III, and perhaps the myth of the Promised Land is a reaction to that experience. What’s certain is that, since then, the vital experience of this people has come to be tied to words such as slavery, ghetto, expulsion, pogrom, excessive violence, and genocide. But also to others, such as memory, faith, overcoming, and above all, hope. Hope, which perfectly defines the melody of the Israeli national anthem, Hatikvah (“The Hope”). This infinitely complex duality results in a way of being and conditions a highly misunderstood collective behavior through the intoxication of the perennial virus of anti-Semitism, which as such, transforms with time in order to survive, defeating the moral vaccines that emerge from the best values that humanity has had to offer. But returning to the title, to what purports to be the origin of this tale, which is no more than the personal perception of the writer, we must travel to the times of the Sefarad, which for centuries was the home to hundreds of thousands of Jews. Today it is estimated that there are almost two million descendents of the Sephardic people worldwide. Those who visit the Auschwitz extermination camp and head to the end, to the commemorative plaques honoring all of its victims, written in all of their languages, will discover that there is also one written in the Sephardic language. I have never understood why there is no similar type of monument in any prominent location in any big city in Spain. Who knows how many of the Sephardic victims of the Holocaust perserved in their houses, in whatever remote locations in central Europe, the keys to their homes in that Spain that they called Sefarad. Recently in Cordoba, the names of the 169 Jews who perished in the fires of the Inquisition between 1483 and 1733 were screen printed onto the front of the Casa Sefarad. This was without a doubt an essential act of justice, but it was also one more step towards the creation of the common memory that takes us back to the times prior to the expulsion of the Jews and Muslims. Much has been written about that time. I am referring to the times of Al Andalus, the golden age of coexistence between the Three Cultures. Coexistence and interconnection that brought about scientific and philosophical development far ahead of the rest of Europe. For many authors, it is no more than a false myth, a kind of positive revisionism, or reconstruction of an invented dream. For many others, it is entirely the opposite, as they affirm that in Spain, there is no record of pogroms against Jews as they existed in much of the rest of Europe. The expulsion decreed by the Catholic Monarchs in 1492 put an end to this golden era, removing part of our essence and giving rise to what has been termed the “Dark Spain.” The various anti-Semitic myths, which have endured overtime by transforming and adapting to the peculiarities of each era, were already there. The libel, conspiracy theories, the legends of power in the shadows, the grotesque fabrications about the kidnapping and murder of children, the crucifixion of Jesus of Nazareth, the pejorative characterization of the Jewish factions, and a long etc. which seems to have no end. That flow of anti-Semitism had extended throughout almost the entire Christian and Muslim world for hundreds of years. This is confirmed by the various councils and synods throughout all of Europe in which they, for example, ordered the burning of holy Jewish books, prohibited marriages and sexual relations with Jews, denied them access to public jobs, ordered their detention in ghettos, and a long etc. filled with humiliation, cruelty, dehumanization, hatred, and extreme violence. But the European Jewish communities continued to survive and achieve a certain degree of prosperity. Albeit, through a general tendency of inbreeding, more or less as a measure to care for their tradition, or perhaps more exactly, to protect it. Subsequently, the intellectual lights of the enlightenment had their impact, and internal debates among the Jews about modernity, active participation in the societies in which they were embedded, and the search for an appropriate balance between tradition, identity, modernity, and emancipation emerged. However, the anti-Semitic venom persisted and tended to get worse. The theories about racial supremacy that would arrive with the nineteenth century would make it even more dangerous and lethal. In 1852, a book written by Joseph Arthur Gobineau would come to light, with a title that could not have been clearer: An Essay on the Inequality of the Human Races, riddled with anti-Semitic affirmations and references to the Jewish people as a factor in the degeneration of civilizations. That is precisely one of the principle theses of this racist pamphlet. The author sustains that racial mixing is one of the causes of the fall of the civilizations founded by the white race. Hitler himself would explain this in his own way in Mein Kampf: “I was disgusted by the conglomeration of races gathered in the capital of the Austrian monarchy; disgusted by that promiscuity of the Czechs, Poles, Hungarians, Ruthenians, Serbs, Croatians, etc. and amid them all, an eternal disruptive bacillus of humanity, the Jew and always the Jew. Gobineau would be far from alone, his work was crucial for that of Stewart Chamberlain, who in 1899 published The Foundations of the Nineteenth Century, a book with two strong ideas: the application of the theory of the evolution of species to the human races, with the intention of demonstrating the supremacy of the Aryan race, and Pan-Germanism, building on the work of Wagner and sustaining that the only option for maintaining the “German racial purity” was to continue marginalizing the Jews. In this intellectual and political context, Zionism was reborn. And I say reborn, because as a concept and political and spiritual vocation, it is much older. Thomas Herlz, a Jew of Sephardic origin (born in Hungry to a German-speaking family) was a journalist and above all political activist who propelled it decisively. The objective of Zionism is clear: the unity of the Jewish people, living in their historic homeland, in a Jewish state with Jerusalem as the capital. Zionism is not only a political option that reacts against the prevalent anti-Semitism of the era, but it is also the conviction of the right to make the historical homeland of the Jewish people a Jewish State. It should not be understood, therefore, that Israel is only the payment to the International Jewish Community for the crimes of the Holocaust, but rather that it is the recognition of a historical right. Nevertheless, the “incredible ascent” of the Nazis to power (driven by their devastating discourse of racial supremacy and massively destructive anti-Semitic hatred, and infinitely amplified by fanaticism, hatred, and what Kant defined as “radical evil”) revealed that this historical right was also essential for survival. On November 9, 1938, the genocidal machinery was launched in Germany. On that one night alone, between 2000 and 2,500 people were murdered, and it is estimated that almost 8,000 properties owned by Jewish families were massacred. 30,000 people were deported to concentration camps, where they would be eventually be exterminated. One of the contemporary forms of anti-Semitism is precisely historical revisionism, consistent with the Goebbelsian maxim that one lie repeated a thousand times becomes the truth. Despite the irrefutable evidence, the testimonies of survivors, or the presence of concentration camps (turned into horror museums, where anyone can verify on-site the grim extermination machinery devised by the Nazis) throughout the entire continent, the denial of the Holocaust reproduces, grows, and posions the moral duty of memory and remembrance of its victims. And what is even graver, it facilitates the political and ideological conditions to repeat the Holocaust. The denial practiced by the Nazis and extreme right-wingers, and by Islamic fundamentalists, if you will, is of variable radicalism. The Revisionist Conference convened by President Ahmandineyab of Iran, who explicitly declared the destruction of Israel as his political project, was a notorious and unfortunate example that was attended by a curious range of ideological factions in perfect anti-Semitic communion. It had the historical value of being the first conspiracy of this nature organized with public money. The famous speech of the President of the United States, Barack Obama, to the Muslim world given at the University of Cairo included a paragraph that has gone relatively unnoticed, in which he condemned and warned against the immorality of the denying the Holocaust. On May 14, 1948, the State of Israel was proclaimed, after a vote of the Assembly of the United Nations, which passed a resolution offering the partition of Palestine into two States: one Jewish and one Palestinian. That land occupied during the centuries of the Ottoman Empire, and subsequently the British protectorate, had the first opportunity in centuries to find a reasonable solution for an adverse fate. Nevertheless, the situation could not be more complicated and intricate. An impossible maze of desired lands, without defined boundaries, considered by both parts to be irrevocable, allowed for a war to break out within hours. The Arab Palestinians proclaimed the Nakba, disaster in Arabic, and the spiral of uncontrollable hate that continues into the present in all possible forms of terrorism and conventional war. Classic anti-Semitism, like a good mutant virus that adapts to environmental conditions in order to continue its destructive intoxication, has found a new way to survive, and I would almost say, to multiply. An example of this is “anti-Zionism,” a political expression shared by neo-Nazis, conservative leftists, and Islamists of various degrees of radicalism. I wonder: Is it legitimate to be anti-Zionist? And the answer is “yes, of course it is.” This is not the problem. The problem is when anti-Zionism is the rationalization of the old and new anti-Semitism. For instance: conspiracy theories, the myth of power in the shadows (well documented in The Protocols of the Elders of Zion), the stereotype of the unscrupulous Jew who kills innocent children, and a long etc. which provides evidence of the many anti-Israel positions. I do not have the slightest doubt that the entire Israeli government merits close scrutiny and tough criticism about the subject, and at the same time, I do not have the slightest doubt that it is a free, pluralistic, demanding, contradictory society, that like any other national opinodromo, is a pendulum that touches all strands of political thought, from the most unpresentable to the most inspirational. But in those statements are anti-Semitic perversions. Firstly because it minimizes the Holocaust, but also because it is an unnecessary offence to its victims, and in the background is another way to criminalize Israel, with lies as its instrument. Israel exists in a hostile geographical context with objective threats that do not hide their pretenses to destroy it. Hamas, Hizbula, the regime of Ahmadineyab, Al Quaeda, among many others of the sort. In memory of the 192 killed and almost 2,000 injured in the March 11, 2004 attacks in Madrid, among divisions between politicians and victims. The 192 dead and almost 2,000 injured in the March 11, 2004 attacks in Madrid are remembered today with numerous floral offerings and tribute acts in which, however, both victims associations and politicians will be divided. Unlike in previous years’ anniversaries of the attacks, commemorated in a grand institutional act which unified the entire society – which last year was celebrated in Congress at the request of the Foundation of Victims of Terrorism – this year each association and institution has organized its own tribute, dividing representatives. As has happened on previous occasions, these acts are not exempt from controversies and the president of the 11-M association Affected by Terrorism, Pilar Manjón, has attacked the Government of Madrid in one of its commemorative acts on the seventh anniversary of the attacks for unveiling a monument in the suburban train station El Pozo without this group. Manjón has accused the vice mayor of the capital, Manuel Cobo (PP), of treating it “with detriment and disregard” in one of the meetings they attended in order to ask the consistory erect a monument there in tribute to the victims of 11-M.
“When we came to the meeting to ask to build the monument, they answered that if we had come for another ‘little monument’ for 11-M, that any day now they would have to make one for the whores of Montera,” she said during her speech at a ceremony organized by UGT, CC.OO., and the Actors Union in the Atocha Station, another of the scenes of the massacre. The president of the association has assured that these are the exact words of Manuel Cobo and has accused the Government of Madrid of six years of standing in the way of the monument that the mayor of Madrid, Alberto Ruiz Gallardón, inaugurated “unilaterally” in the El Pozo station. “Leave our dead alone,” said Manjón to the attendees of the ceremony, which took place in Atocha, where they said that 11-M is a “closed case” after a “serious and just” trial. Tomás Gómez, the socialist candidate for the Community of Madrid, also attended the ceremony, where he demonstrated with declarations to journalists his deep respect for Manjón’s words, as well as him sympathy and solidarity. Gómez lamented that there was no unifying ceremony and reminded us of the victims of the attacks at the base of party discrepancies. “The victims do not deserve party disputes,” he said. For his part, the general secretary of the CCOO of Madrid, Javier López, has also said that he does not understand the reasoning for different tributes. “I do not understand why they are using 11-M to campaign and why they want to take the focus away from those who unfortunately should be the center of attention,” he stated. In addition, the collection is surrounded by benches and red flowers, specifically ‘sevillanas,’ so that the monument has life and people can enjoy it. The project also includes the improvement of the urban landscape surrounding the station and the installation of photovoltaic panels to generate the energy necessary for light and the water spouts. In total, it cost 708,000 euros for the State Fund for Employment and Sustainability (FEES). The day began at 9:00 with the traditional floral offering of the Community of Madrid, presided over by its president, Esperanza Aguirre, the mayor of Madrid, Alberto Ruiz Gallardón, and the leader of the PP, Mariano Rajoy, in the regional seat of the Puerta del Sol, on the facade of which is placed a memorial plaque for the victims and the Madrileños who helped them that day. Two students of the Police Academy placed a laurel wreath below the plaque. Dozens of politicians, members of emergency services, firefighters, local police, the army, as well as dozens of citizens and representatives of the victims of terrorism attended the act. They all observed a moment of silence while a segment of Mozart’s Requiem played, followed by the hymn of Spain, after which all the attendees joined in applause. The Forest of Memory, located in the Parque del Retiro, was also the site of an emotional tribute to the 192 dead, each represented by a tree. This tribute, organized by the Association of Victims of Terrorism (AVT), consisted of a floral offering and the reading of a manifest by the victims “in defense of truth, memory, dignity, and justice.” In addition, they observed a moment of silence in memory of all the victims. Angeles Pedraza’s group of victims also organized tributes in 17 Spanish cities in memory of all victims of terrorist attacks. In addition, the platform “Voices against Terrorism” prepared a day of memory in Alcalá de Henares at 6:00 PM Friday, involving, among others, their president and the exp-president of AVT, Francisco José Alcaraz, the mayor of Lizartza, Regina Otaola, and the ex-official of prisons José Antonio Ortega Lara. Also, following the tradition of previous years, a committee of victims will leave at 7:00 AM from the plaza of the station at Alcalá de Henares and will travel by train the extent of the Corredor del Henares, stopping in each station to make a floral offering to the victims, and finishing at Téllez Street. This week, we received news of the passing of Galina Kozhevnikova, 36, a human rights activist highly involved with the denunciation of racism and intolerance in her city, Moscow, where she worked as Sub-Director of the NGO SOVA Center. A long illness took her after years of fighting, but without a doubt she will leave a lasting memory among those of us who knew her and had the fortune to share with her the fight for dignity and human rights for all people, independent of their origin, sexual orientation, nationality, etc. Being an activist against hate crimes is no easy task. It requires an iron will; a spiritual strength in the face of the most horrible misfortunes a person can suffer; and what’s more, entails a rather high level of personal risk, especially in Russia, where Galina developed her affiliation and involvement. SOVA Center has suffered incessant harassment from hate groups and hostile pressure from the authorities, which even today distrust independent civil society. Some of their activists have been forced to seek refuge in the United States, after receiving a number of direct personal threats, including threats against their families. It is devastating, when we take into account that we are speaking of a country where human rights activists are sometimes killed. We remember the names of Serguei Makelov, a lawyer, or the young journalist Anastasia Baburova, who are added to the killing of fellow journalists Anna Polistoskaia and Natalia Estemirova, the latter a member of the NGO Memorial. Because of this, the death of our friend is a double blow: the loss of a loved one personally suffered by her family and friends, and the hole her absence will leave, because in times like these is not easy to find a person with the strength, vision, values, energy, and determination needed to fight against intolerance. Soon, her organization will publish the last report written by Galina, about racism and xenophobia in Russia. Undoubtedly, it will reflect a growing tendency in populist declarations, proliferation of hate groups, aggressions, and killings. We can only hope that it will provide the shock needed for the authorities to act and brace this fragile democracy. Surely, hundreds of activists will continue working daily to exorcise Europe of its worst demons, hatred and totalitarianism, with the sadness of the loss of one of our own, but with the assurance that our work is essential, and that our cause is the best. It is an anthem for the human rights movement. They aborted a demonstration for the second time in a week in Germany. Members of the MSR participate in the march. Twice in the last week, various neo-Nazi groups have attempted to demonstrate en Dresden (Germany) and both times have been stopped. The protest this Saturday was authorized, but the citizens of the capital of Saxony were the ones who confronted the right-wing extremists. The powerful German Confederation of Unions (DGB) estimated some 21,000 people joined the protests to expel the neo-Nazis from Dresden, a number expected to be less than 4,000 initially, according to data collected by Efe. A Dresden court had permitted the Nazi demonstration this Friday, despite the resources presented against it by the local government. Last weekend, some 17,000 residents of Dresden stopped around 1,300 neo-Nazi from marching through the city center to celebrate the anniversary of the Dresden bombings during the Second World War. A wide police deployment attempted to guarantee that the thousands of anti-fascists would arrive at the site reserved for the neo-Nazis, although the demonstrators broke the security barriers and arrived at the zone, where there were already some 600 extremists. Others blocked routes of access to the reunion spot for the neo-Nazi march in the city’s train station. Around Dresden’s central station, young anti-fascists simultaneously burned half a dozen barricades set up to block the streets and prevent the neo-Nazis from marching toward the city center. The neo-Nazi groups ended up abandoning Dresden and heading for Leipzig, 100 kilometers to the east, to celebrate their march there. The police reported that the participants in the right-wing extremists’ march would be escorted in small groups to Leipzig by law enforcement officials. Throughout the day, there were conflicts between anti-fascists and security forces. The police used tear gas and hydrant carts to block the protestors from the neo-Nazis. Representatives from parties all across the political spectrum, churches, unions, and civil associations, along with thousands of citizens on foot, joined the protests against the presence of ultra-right activists in the city. At the same time, in 54 Dresden churches, vigils were mounted in protest against the presence of right-wing extremists in the city, where they condemned racism, xenophobia, war, and violence. Some activists threw rocks, bottles, and flares at the officials. They also damaged several vehicles and broke the windows of an official building. The clashes produced casualties and arrests, said a police spokesperson, without giving numbers. MSR, a Spanish right-wing extremist party, confirmed on their webpage the presence at the demonstration of its members. The extreme right created blacklists of people who should be retaliated against in the case of a successful military coup. We are at an anniversary. The thirtieth anniversary since the attempt at a coup d’état. The media will once again repeat the same speech as always. The bravery of Suárez and Gutiérrez Mellado physically confronting Tejero’s men. The exemplary and model behavior of the king. The night of the transistors… blah, blah, blah. An event, however, scarcely cited in the adundant bibliography available on 23-F is the creation of blacklists by extremist groups. Relatives of leftists and people of democratic ideology who should be retaliated against in the event of a successful coup. On the list, for the first time, there appeared the names of artists and intellectuals clearly associated with the leftist world, Manuel Vázquez Montalbán, Rafael Alberti, Antonio Gades, Pepa Flores, Raimón, Lluis Llach, Paco Ibañez or José Sacristán, and various others who it is unclear what they were doing on such a list, which included the names of actors Tony Leblanc and Concha Velasco. A second section listed, province to province (including Ceuta and Melilla), the names of different local “reds” who should be “taken for a walk” the day after the coup. In total some 3,000 people. Associated with a small Madrid-based group, it is conceivable that the information given out by the ultras was taken from the 1979 electoral lists, as well as the old archives of the extinct Brigada Político Social, something not impossible taking into account the multiple contacts between the extreme right and the State security forces. Journalist Mariano Sánchez Soler mentioned in his book “The bloody transition” the existence of fascist groups in Valladolid, Madrid, and Barcelona coordinated with the so-called Operación Cuchillo. The night of 23-F would be, in addition to the night of the transistors, the night of the fascist covens and blacklists. In anticipation of the success of the coup d’ètat, informal groups of the extreme right met of their own accord to create lists of people who should be handed over to the new military authorities. In Asturias, for example, we have eyewitness accounts of a list in Oviedo and another in Grado, traditionl “red” parts of the region. There probably existed many more. In Galicia we know of similar lists from write Manuel Rivas, who himself was among the people listed. After the failure of 23-F, the lists would continue to float around for some time in the galaxy of ultra projects. Slightly before the elections in which Felipe González would triumph, in 1982, intelligence services aborted a new coup conspiracy planned for October 27, the day of reflection proceeding the general elections. The so-called Operación Halcón y Marte would be the civil complement to the military coup. According to Cambio, 16,200 right extremists would be involved in this sinister operation. While the military would collapse Madrid and take control of the strategic points in the Spanish capital, groups of civilians coordinated with the coup would assassinate leftist leaders and personalities in Madrid and Barcelona. The regression projects made little sense. Since 23-F, the claims of the left had been even more moderate, and there was a general context of reflux of social movements that had animated the early moments of the democratic process perfectly compatible with the capitalist status quo. After the attempt in Febrary, the process for autonomy slowed down, the monarchy was consolidated, Spain accelerated its entrance in NATO, and the unions signed an new agreement with employers. If anything was reaffirmed on 23-F, it was not the Spanish democratic process, as the only story of the transition tells us. Rather, just the opposite, its guarded nature. Protected by Alicia Sánchez Camacho, Xavier García Albiol follows with her idea of restricting “social benefits” for Roma gypsies. The conservative leader delivered this forceful message in his announcement as a candidate for mayor of Badalona, a city which the PP believes to have real possibilities of governing after the municipal elections on May 22. “In Badalona we have a very serious problem with lack of public spirit and insecurity and many of these problems are created partly by the immigration which has come to our city,” stated Albiol, who then continued to emphasize that the “great majority” of immigrants are “honest” people. He remarked that, if elected mayor, he will not allow this, and will give “priority access” for “non-basic” social services to the citizens of Badalona over people there illegally. “I cannot permit any citizen to be without a social benefit which is given to an illegal immigrant,” he declared among applause from the attendees, while criticizing the socialist government of the city for, in a time of serious crisis, conceding 200,00 euros of benefits to “associations of Morocco and other countries” instead of giving them to food allowances for residents. For her part, Sánchez Camacho demanded that politicians “speak clearly.” “Saying what we are thinking could cost us a number of upset Catalonians, but society is fed up with leaders who hide when things go badly,” added the president of the PP in Catalonia. She also predicted that García Albiol as well as Alberto Fernández Días, candidate for mayor of Barcelona, also present at the event, will be “decisive leaders” to confront the obstacles for the future of Barcelona and Badalona, the third largest city in population. The event was attended by the leadership of the party in Catalonia, but also by representatives of civil society in the city, among them president of the DKV Joventut, Jordi Villacampa. Albiol also pointed out the presence of representatives from a gypsy organization from the district of Sant Roc, who supported him in the face of the “political and media lynching” he suffered for comments about the problems caused by immigration in Badalona. The Progressive Union of Public Prosecutors (UPF) demands the banning of xenophobic parties and a Public Prosecutor’s Office against racism. May 24, the Congress of the Progressive Union of Public Prosecutors (UPF) adopted the following resolutions against racism, xenophobia, homophobia, and human trafficking. Associations promoting racism, xenophobia, homophobia, and human trafficking are illegal; therefore the UPF considers it necessary to demand that the authorities in charge of security create special police units responsible for the prevention, investigation, and persecution of these illegal associations. The UPF demands the use of all legal instruments. In particular, that the judicial Police officers act under assumed identity and acquire and carry objects, effects, and instruments of crime as well as decide to confiscate them with authorization from the investigating Judge or the Head Prosecutor under Article 282 of the Criminal Procedure Act, for being investigations concerning the activities of organized crime. The UPF demands that the State Public Prosecutor’s Office attend to this form of criminality and provide a response which considers these groups as organized crime, for the purpose of the appropriate response by the Public Prosecutor’s Office, either through a specialized Public Prosecutor, or in parts of the local Public Prosecutors, under the coordination and responsibility of a Board Attorney. The UPF demands that the State Public Prosecutor impart the necessary instructions to the Prosecutor of the Supreme Court in order to exercise all legal actions to ban these parties or associations under the provisions of the law of parties. The Fundamental Law 672.002 of June 27 establishes in Article 9, Paragraph 2, that a political party will be declared illegal when its activity violates the democratic principals, particularly when it seeks to damage or destroy the regime of liberties or to prevent or eliminate the democratic system through one of the following behaviors, carried out in a serious and repeated manner: (A) to systematically violate the fundamental rights and liberties; (B) promoting, justifying, or exonerating attempts against the life or integrity of a person or persons; or (C) the exclusion or persecution of people on the basis of their ideology, religion or beliefs, nationality, race, gender, or sexual orientation. Under Article 11.1, the Public Prosecutor’s Office is entitled to seek a ban of these political parties. The UPF requests that, in its entrance into effect, the reform directive establish the minimum time necessary for the proposed actions. The UPF requests the modernization of the Public Administration in cases of immigration so that its bureaucracy and inefficiency do not create as the only solution the application of sanctions against foreign citizens. The UPF condemns the attempt to waste public resources to “protect” society from those seeking work rather than to prosecute offenders. The UPF shows its satisfaction with Spain’s ratification of the European Convention on Action against Trafficking in Human Beings, which appears to be imminent, according to the news spread. Taking into account that, until now, the Spanish legislature has not fulfilled its obligation to put into effect the international instruments in the scope of the United Nations – in particular the Protocol to Prevent, Suppress, and Punish the Trafficking of Humans, especially Women and Children (Palmero, 2000) – which are already ratified and in force since 2003, we trust that incorporation of this new Convention into our Law will serve to rectify the criminal policy followed so far, which gives preference to the prosecution of smuggling immigrants and the defense of the State’s right to control migratory flows, and is relegated to ignore the urgent need to categorize in an independent and distinct manner the human trafficking – for their sexual exploitation, labor, or extraction of organs – as a crime against humanity which threatens the most basic human rights, putting the victims in a situation of unbearable vulnerability and exclusion and constitutes one of the criminal modalities of international relevance. Likewise, we should emphasize that no reform in this case can be effective if the putting into force of the sort of laws called for in the aforementioned Protocol is not accompanied by the legal measures necessary to establish a general system of assistance and protection to trafficking victims, both in regards to their involvement in criminal proceedings against their exploiters and in regards to achieving the necessary physical, psychological, and social recuperation, providing even the possibility of their integration into Spanish society.